PRO Scientific is the ideal source for high quality homogenizing products for sample preparation within the cannabis industry. Our PRO Homogenizers and generator probes are precision designed to provide reliable, reproducible results that are required for this industry. The testing and quality controls within the cannabis industry demand such a precision homogenizing product to assist in determining and monitoring the cannabinoid potency and pesticide residue. PRO Homogenizers help both small startup and established labs in makings sure measures are taken to protect their patients by assisting in the production of high quality products that are safe. 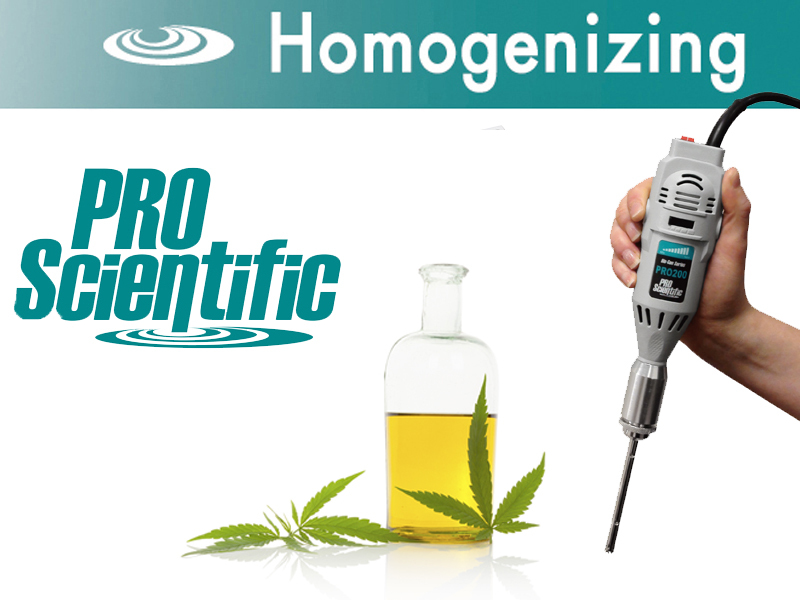 PRO Scientific Homogenizers are ideal for the extraction of cannabis for the development of cannabis infused products. Homogenization of cannabis samples allows for a stable emulsion to be created that is shelf stable. A range of setups are available depending upon your budget and processing requirements. Cannabis Homogenizing Package Kits now available! 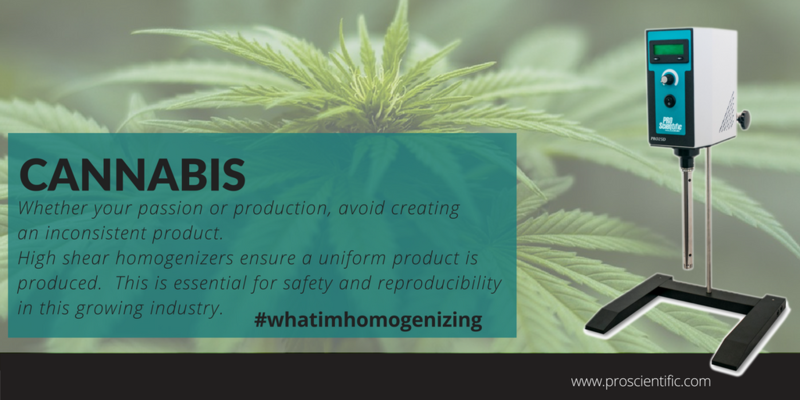 Why use a PRO Homogenizer for cannabis testing and product development? The viscosity of your sample will drastically impact the total volume that can be processed. Please contact PRO Scientific if you are processing a viscous/thick sample (i.e. thick honey like solution) so we can make sure you are getting the best product for your needs. Our D-Series Benchtop Homogenizer is ideal for processing volumes larger than 5L. Contact us today to create a custom package.